Bonnie has shared her story about how Kids N Pets Stain And Odor Remover removed pet stains from her carpet, saving her family $1,800! That is definitely a great return on investment. Our family is lucky to have a sweet little Chihuahua and a great big lovable black Lab. Our pets are normal, house trained dogs who know better than to use the floor for their bathroom. Unfortunately even the best trained animal can’t control where and when they vomit. We had run out of our usual brand of dog food and my husband brought another type of food home. Both dogs ate the food, however the food didn’t agree with our big dog and she apparently threw up in the middle of the night. Twice. On our light beige carpet, in military housing and about 3 weeks before we had to move to a new post! By the time I found the two vomit stains, both almost eight inches wide; the red/orange coloring in the dog food vomit had turned the carpet a nasty color. I used my carpet shampooer, tried many other kinds of cleaner but nothing really helped to totally get rid of the stain. I went to the store looking for something new to try and I spied Kids N Pets. It was endorsed by Animal Planet and I figured that if anyone knew about pet stains, it would be them. We were just days away from "clearing" housing, which is when they send in a representative from the housing office to walk through your home to see if there are any damages. Each sign of damage has a certain dollar amount and of course the carpet is one of the most costly. We knew from friends that if anything was wrong with the carpet, housing would charge $1,800 to replace it all. I have used other products that have the enzymes to properly clean urine and other stains, but in my opinion, they all smell horrible! I was pleasantly surprised with the pleasant lemony scent of Kids N Pets. I followed the directions which was to clean up the mess with towels, pour Kids N Pets on the remaining stain and let sit for at least five minutes; then blot with a clean rag. I used my carpet shampooer instead of using the rags, but after five minutes or so the red/orange vomit stain was a very light pink stain with a nice citrus scent. I repeated this two or three times and eventually both stains were so light they were almost unnoticeable. We finished getting our house ready for the inspection and hoped they wouldn’t say anything about the stains. After the rep did her walk through in our home we were stunned to find out she didn’t find anything to charge us with. The stains apparently were gone enough to fool a professional mess-finder!! Since then I make sure to always keep Kids N Pets on hand since we do have 2 dogs and 3 kids. In fact, my toddler is potty training now so accidents happen often in our house. I know that the enzymes will permanently erase the urine smell and I won’t have to worry that my pets will be attracted to that spot. For the amount you get in a bottle as well as the price and effectiveness, I recommend this cleaner to all my friends. It really does what it says it does!! Wow, Bonnie. That is a great story with a happy ending, and it sounds like this product worked really well for you. 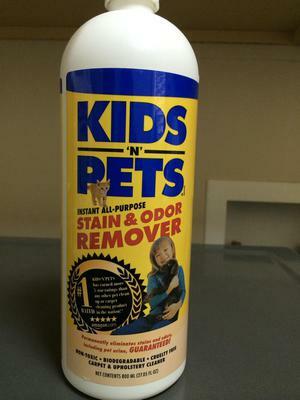 I would love to hear from others about this product too, either in the comments, or you can share your own pet stain removers reviews here, of either Kids N Pets or another stain or odor remover. After reading the review above from Bonnie about this product and how it worked on cleaning the carpet, I was excited to use it myself. I received a bottle from the manufacturer, and used it off and on for several months, and then it lay forgotten on the back of the laundry room shelf for several more months until I again came across the review above, and remembered, oh yeah, I should write about my experience with it. If you hadn't already guessed, I wasn't overly impressed to not even remember to share my thoughts about it for several more months! I don't have any pets (well except fish) but I do have kids, but thankfully I have not encountered any need to try to clean my carpet with this product during that time, so I can't speak as to how it works for carpeting. However, I do a lot of laundry with three active kids in my home, so I have had several occasions to use this product as a laundry stain pretreater. I tried to use it specifically on things that seemed especially like kids types of stains or odors, including some bedwetting accidents and stains such as dirt and mud. After using this product I didn't have any lingering smells from the bedwetting, but to be honest I attribute this more just to washing everything quite quickly in hot water with detergent, since that is normally what I do and don't suffer from urine odor. However, I was not very impressed with this product as a pretreater. I didn't seem to me like it did much for helping remove clothing stains before washing. I wasn't blown away, basically, but thought it was a OK but not spectacular product. After a few times trying it out on stains, and being rather disappointed with the results, the bottle slowly got pushed to the back of the laundry shelf, as I explained above, and there it sat. I would much rather reach for my Shout Free, Biz or Oxiclean to try to get rid of stains than this stuff. I will most likely try to save the rest of the bottle I received until I get a carpet stain, and see how it works on that I suppose since I would rather use something I have more confidence in when washing my family's clothes. Has anyone else used this product for their carpet, clothes, or anything else? 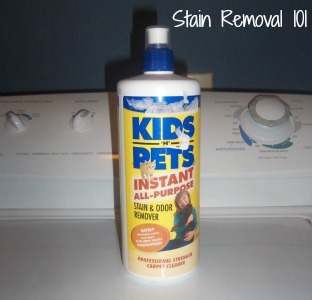 In addition, I've reviewed the stain and odor remover, but there are other products from Kids N Pets as well (including a product made specifically for laundry stains). I'd love to hear reviews from even more people, sharing how any products from this brand have worked for you. You can share your review or experience here, and I'll add it to the site! We have multiple cats in our house. This is the BEST product I've found for cleaning up their vomit from the carpets! Have been using it for a few years now and wish I'd found it even earlier. There is no better product out there! I like OdoBan, but I think I like this stuff a little bit more.